Tenkar's Tavern: What Mapping Program(s) Do You Use? I use Campaign Cartographer (w/Dungeon Designer, City Designer, Perspectives, Character Artist, & Cosmographer add-ons) exclusively. I've never found it difficult to use, but that's because I slavishly follow the Tutorials Profantasy includes...have you tried those? I found them to be super-helpful in learning how to make the software do what I want it to. I use hexographer. I like the ease of use. It turns out there are plans for a Hexographer II coming soon to kickstarter. For dungeon maps, these days I'm using Sketchup to make a perspective reference, which I print and draw on with pencil, then ink; I then scan it back into Photoshop for cleanup. For wilderness maps, it's all Photoshop. I used CorelDRAW, but I'd only recommend that if you can devote the time to play with the software. If you are having problems with Hexographer, you might find it a little daunting. Still, I find it great for emulating a a number of particular styles. Does Hexographer have video tutorials? Maybe start there if you are trying to do somethign specific. I've tried CC, Fractal Mapper, Hexographer, and a few dungeon mapping applications I don't even remember the name of. I don't have anything really negative to say about them (except for CC's price... yikes...), and each of them do things very well. After I stopped looking for miracle mapping programs that will allow me to create great looking maps with my very limited artistic ability, I became much happier. These days I mostly map in Inkscape (for overland maps) and with pen/paper (dungeon and town). I can barely draw a stick figure, but with the proper patience and emulation of better cartographers than myself, I've been creating maps that I'm so much happier with than my time spent in mapping programs. I use MS paint and a blank graphpaper jpg. I thought everyone in the OSR was still required to use graph paper their parents brought home from work. Adobe Photoshop and Illustrator, often starting with pencil and pen then scanning. I have used Campaign Cartographer in the past, I bought CC1 ages ago and upgraded through both CC2 and CC3, but I don't get the same satisfaction from using it as I do when I hand draw my map and scan it, or use my custom brushes (scanned from hand drawn elements) in Photoshop. Bear in mind that I use Adobe Photoshop, Illustrator and InDesign on a daily basis for my primary job, so that makes it somewhat easier for me to work with. It takes a text description of a hex field and makes the map for you - no fuss, no muss. The "random" button there generates a field based on the Welsh Piper's random terrain generation tables from way back. You can put your own icons in (SVG, many options available) change colors, etc. 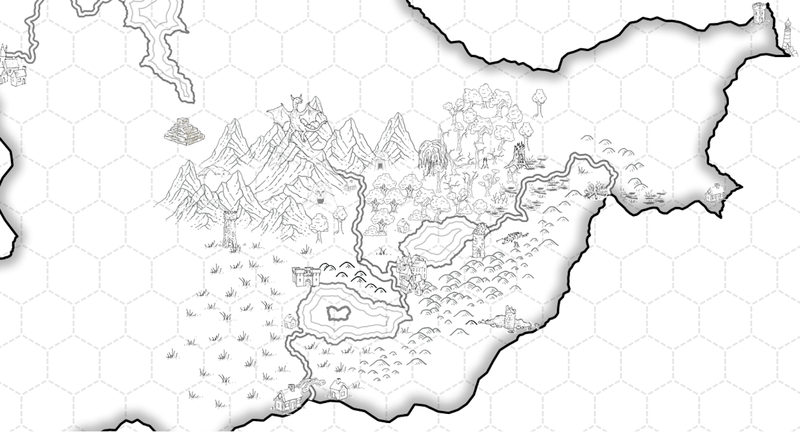 It's good stuff, and frees you from drawing/redrawing/reredrawing as you change things - or - simply by commenting out lines in the text file you can hide hexes from a player facing map, or grow the map as they explore - on demand, just-in-time mapping. I draw maps with pencil on plain paper or graph paper as appropriate, sometimes using a ruler or compass. No-one other than me ever sees the map – so why spend time on what it looks like? Some maps are seen by players (e.g. a city overview or wilderness), but I still do them with pencil (albeit a little more carefully) so they can be added to or annotated during play. The thing I do put a lot of effort into is props such as treasure maps, which can be really effective. I use Adobe Illustrator and Photoshop. Like Anthony above I've been using them professionally for years so it only makes sense I use them on maps as well. I use Campaign Cartographer a lot, especially for colored overland maps, but for simple hex or dungeon maps I use Hexographer/Dungeonographer. I use Inkscape (a free alternative to Illustrator) to create most of my maps. I might do some final tweaking in GIMP but the heavy lifting is done in Inkscape. I use CC3+ for most maps, Hexographer for some and still use Dungeon Crafter on occasion.